FORT LAUDERDALE/DAVIE, Fla. – It’s a match made on the beach! What could go together better than the annual Tortuga Music Festival and a fun way to help raise funds to further sea turtle research in Broward County? Thanks to the First Annual Sea Turtle Derby, festival goers and lovers of sea turtles can help support ongoing research by the Nova Southeastern University (NSU) and the Conservation, Movement and Ecosystem Dynamics Lab at NSU. Representing Rock The Ocean’s Five Core Issues are a distinguished list of more than 30 worldwide leaders in ocean conservation that are hand selected and invited to share knowledge onsite at this year’s festival. Conservation Village also allows attendees to enjoy games, interactive touch tanks, cooking exhibitions, the latest in ocean technology and speak with some of the top ocean conservation groups in the world. To find out more about each organization onsite this year, visit http://www.tortugamusicfestival.com/conservation/. NSU has partnered with Rock The Ocean to kick-off to the first-ever interactive Sea Turtle Derby. This unique sea turtle “race” features six sea turtles named for some of the artists performing at this year’s Tortuga Music Festival. To see which artists have turtles in the derby, visit the tracking website at TortugaMusicFestival.com/seaturtlederby. You can watch the progress of each of the artists’ turtle namesake as she makes her way through the seas. While the participating artists are both male and female, the turtles in the derby are all females because it’s the mama turtles that are tagged on Broward’s beaches after they lay their eggs – male turtles spend their lives at sea. You can also get updates on social media with the hashtag #RaceToTortuga. The race is currently underway and will end at 6 p.m. Monday, April 8. Turtle tracking isn’t limited to the festival – sea turtle fans can visit turtletracking.org anytime to see all of the turtles NSU has fitted with a satellite tag. 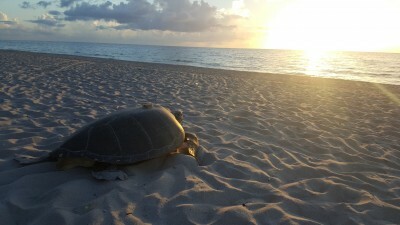 This “turtle-tastic” race is made possible via NSU researchers, who are using cutting-edge technology, equipping mother sea turtles that come ashore to lay their eggs with a satellite tracking tag (or beacon) that allows the tracking of each turtle’s movements after they leave Broward’s shores. It’s these “sat-tags” that allow the Sea Turtle Derby to track the paths of the six competing turtles – with the one that logs the most miles “winning” the derby. What makes this fan-interactive is that people can donate toward their favorite artist’s turtle, with their donation going toward sea turtle research and conservation. Everyone who enters, donation or not, is entered to win the Grand Prize: two, 3-day festival passes and the chance to meet one of the headlining artists (Jason, Thomas or Kenny) performing at this year’s event!. Dr. Burkholder is also the Director of the Marine Environmental Education Center at the Carpenter House and the Broward County Sea Turtle Conservation Program as well as a research scientist at NSU’s Guy Harvey Research Institute. The three-day, newly three-stage festival continues to heighten excitement among fans as announcement of the Conservation Village follows news that Jason Aldean, Kenny Chesney and Thomas Rhett will headline this year’s festival alongside Danielle Bradbery, Kane Brown, Sheryl Crow, Delta Rae, Lindsay Ell, Morgan Evans, Flo Rida, Chris Janson, Jillian Jacqueline, Joan Jett And The Blackhearts, Cody Johnson, Elle King, Dustin Lynch, Maddie & Tae, Midland, Maren Morris, David Lee Murphy, Carly Pearce, Cassadee Pope, RaeLynn, Michael Ray, Trombone Shorty, Mitchell Tenpenny, The Wailers and more will perform across the weekend. Single-Day and Three-Day passes are available now at TortugaMusicFestival.com. Media can apply for credentials by visiting www.tortugamusicfestival.com/press. All sea turtle related research activities depicted or described were performed by authorized personnel on FWC MTP-255.